Chances are you concentrate on the day-to-day strategy of your business, not the comprehensive objectives of your business. As your business grows, your IT objectives should also be re-evaluated. Some good questions to ask yourself include: Where is my business at now? Where do I want my business to go? How is my business going to get there? By answering these questions, particularly the last one, you’ll be able to come up with a good idea of what are your IT business objectives. Hurricanes and floods can damage business property. Increased temperatures can lead to increased costs due to constant cooling and air conditioner servicing. Server rooms can overheat. The Internet can go down and you could suffer from downtime. It’s important that your business is positioned with multiple recovery points to better manage these types of risks. The typical struggle in IT budgeting is the balance between operational and new technological expenses. Sometimes, your business moves in a different direction than the one you had planned. It’s a good idea to look at how your IT budget aligns with your business to ensure you maximize your IT opportunities despite a changing landscape. Security is vital to your business, and together vulnerability and penetration tests provide an overall picture of the flaws that exist in your applications and the associated risks. A vulnerability assessment detects if and what vulnerabilities are present in your infrastructure, while a penetration test finds and measures severity of flaws. Contracts for IT services, software vendors, and hardware vendors establish important expectations and requirements. You should review all contracts for upcoming expirations, upgrades or downgrades considerations, and re-instatement, if necessary. It’s important to conduct an overall assessment of your IT plan before you ditch your flip-flops for snow boots! Not sure where to start? 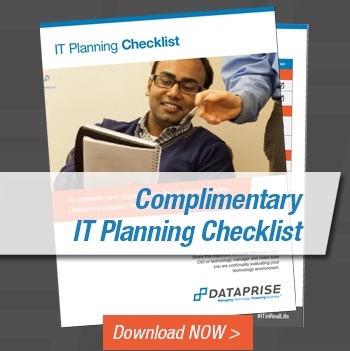 Contact the experts at Dataprise for more information and assistance.